This 15-chapter, 500-page book with 35 editors and authors covers entirely new ground. Some of the authors are well-known and have years of experience in the field of oils and fats. However, more than a dozen new authors present fresh perspectives that are not covered in other books, published by AOCS and other publishers that cover lipid oxidation in full. Consequently, Lipid Oxidation (Challenges in Food Systems) adds to the sum total of knowledge with new science and without much duplication. Even the book’s subtitle, as one of the authors in chapter 2 points out, indicates a novel shift from the traditional focus on the oils themselves to a focus on oils within foods. The control of lipid oxidation remains an ongoing challenge, as most foods constitute very complex matrices. Lipids are primarily incorporated as emulsions, and chemical reactions occur at various interfaces throughout the food matrix. Recently, incorporating healthful lipids into food systems is becoming a popular way for food manufacturers to deliver products with desired nutrients. Many food ingredients contain a vast array of components, some of which may be unknown or constitute diverse or undefined molecular structures. Hence, mitigating lipid oxidation in such food systems requires new approaches. The first two chapters by Schaich cover oxidation mechanisms and also the main issues in analyzing the products of lipid oxidation. I found these two chapters absorbing in their detail. The first challenge is to extract quantitatively all the lipids from the foodstuffs, whilst ensuring that the lipids that are being extracted are not oxidized in the process. It is a common problem in food analysis that the extraction is either incomplete or the technique used extracts too much non-lipid material. The use of ASE (accelerated solvent extraction) is fully discussed. The sound and comprehensive discussions in these first two chapters will assist practioners in sorting out these common issues. There is a wealth of useful information gathered in these two initial chapters, such as the difference in using nitrogen or argon for sparging oils. (Argon is more soluble in lipids and solvents than nitrogen.) Oxygen and water permeability for the plastic materials that are normally used to store samples are also listed and discussed. One of the basic and commonly used analyses for lipid oxidation is the peroxide value. This analysis was first developed in the 1930s (Wheeler and Lea), but continues to be subject to error due to several factors listed in the chapter on analysis. Schaich proposes using a variety of approved methods to evaluate foodstuffs for oxidative status and referencing the most useful ones. This reviewer would have liked to have seen a discussion and comparison of the early benzidine method, subsequent anisidine value, and the controversy over using TBARs (Thiobarbituric acid reactive substances). Chapters 3-5 focus on emulsion systems which are very susceptible to oxidation. Chapter 6 examines the stability of enzymatically modified fats, an industrial technique that has replaced hydrogenation. Chapters 7 and 8 review the antioxidant “polar paradox hypothesis,” and look at studies that contradict the current understanding, introducing the concept of the “cut-off theory.” Testing out patterns from volumes of confusing data is one method scientists have traditionally used to form testable hypotheses. This is what one scientist did whilst sorting through confusing and apparently contradictory data on the performance of antioxidants in various food systems. Patterns found suggested that, all other factors being equal, polar or hydrophilic antioxidants were more effective in the type of low surface-to-volume situations that occur in bulk oils. In contrast non-polar or hydrophilic antioxidants were more effective in high surface-to-volume situations such as occur in emulsions. Polar materials work best in non-polar matrices; non-polar antioxidants work best in polar systems. This is known as the “polar paradox.” These authors review Rancimat results on oil blends using different antioxidant systems. Results for olive oil were interesting, comparing tyrosol with hydroxytyrosol. The stabilisation of the complex lipid systems that occur in infant formulae could be improved by applying some of the science discussed in these chapters. Chapters 9 and 10 look at antioxidant evaluations and at assays, such as ORAC (Oxygen radical absorbance capacity) and others, which are being used to promote antioxidants in food even though many of these analyses have no direct correlation with health benefits. These authors point out that in complex food systems, the phase distribution of antioxidants such as polyphenols with starches, proteins, and other lipids may alter the ability to neutralize radicals. This does not seem an issue when antioxidant capacity evaluations are carried out on homogenous systems such as oils. So, as they point out, it is not surprising that there is poor correlation between the antioxidant capacity of a sample using chemical reactions and the antioxidant behaviour in food or biological systems. Chapters 11-15 discuss the important subjects of natural antioxidants, such as green tea and rosemary extracts, with a focus on their utilization in food systems. This is extremely important, as there are global initiatives aimed at totally removing synthetic antioxidants such as TBHQ from food due to toxicity concerns. There is an intriguing section on ergothioneine, extracted from ergot or mushrooms, in Chapter 12. 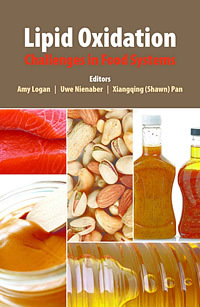 The last chapter is co-authored by the editor Dr. Amy Logan, who has been well known for her lipid work in Australasia. Her work at the CSIRO, co-authored by Dr. Peter Fagan, provides excellent insight into the stabilisation of oil-in-water emulsions and the novel use of canola-based phenolic compounds. Few errors were found in the book. The index is quite adequate, and a commonly used modern and innovative touch is to include the pictures and brief biographies of the authors and editors at the back of the book. I would recommend this book as an extension to existing literature for all technical personnel in the Food and Natural health products industry. · Lea, C.H., The effect of light on the oxidation of fats, Proc. R. Soc. Lond. B 108:175–189 (1931). http://dx.doi.org/10.1098/rspb.1931.0030. · Wheeler, D.H., Peroxide formation as a measure of autooxidative deterioration, Oil Soap 9:89–97 (1932).